Farmers who are interested in adopting new practices or starting the journey to improved soil health can benefit from having a longer-term plan and clear expectations of the steps involved by signing-up for the S.T.A.R Program. As they continue to make changes, they also benefit from ongoing encouragement, recognition of progress, and peer acceptance of their changes as standard farming practices. This program is designed to fill those needs while providing a mechanism for tracking and verifying practices changes at a county level. The 5 Star Assessment awards points for the adoption of practices that have been identified locally as a priority for addressing local resource concerns. From improved nutrient management to cover crops to edge of field water treatment and even crop rotation or inclusion of livestock, a suite of practices can result in between one and five stars. Practices are verified by the farmer’s retailer, strengthening the conservation conversation between the farmer, their retailer, and their conservation advisor. The farmer is given a field sign with their awarded number of stars, which can be added on as they adopt additional practices. The signs provide farmers with recognition of their good work and create awareness in the farming community, leading to a normalization of the new system of production practices. 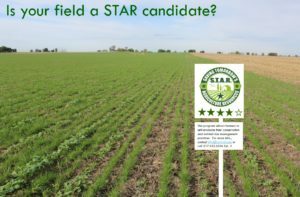 The simple ratings are county specific and vetted by a local technical advisory committee made up of representatives from all the ag sectors – retail, commodity, agency and farmers. Participating farmers will also be encouraged to enroll in ISAP’s complimentary programs - the 5-year Transition Program and Precision Conservation Management.